On Wednesday, The New York Times reported that Toyota and Nissan have expanded a recall of vehicles containing potentially defective airbags from the Takata Corporation. The automakers added 6.5 million vehicles to the recall, the Times wrote. If you or someone you love has been injured by a malfunctioning airbag, you may be entitled compensation through a Takata airbag recall lawsuit(http://www.edwardslawok.com/takata-airbag-recall-lawyers.html). Do not hesitate to contact our skilled personal injury attorneys in Tulsa for experienced representation in a defective product case. The newspaper noted that Toyota conducted tests and learned that the airbags were vulnerable to leaks, the Times said. The newspaper also said that when these air leaks occur, the ammonium nitrate propellant thats supposed to inflate the airbags could be contaminated by moisture and become unstable. This damaged airbag propellant can then lead to gas escaping too quickly and can cause the metal casing of the inflator to explode as a result, according to an article from The Wall Street Journal. Last year, the National Highway Traffic Safety Administration (NHTSA) issued a statement urging some vehicle owners to replace defective Takata airbags. In addition, the Los Angeles Times reported in February that the NHTSA was fining Takata $14,000 per day for failing to cooperate with an investigation conducted by the Department of Transportation. Were You Injured by a Faulty Airbag? Contact The Edwards Law Firm. You may be able to claim compensation for your injuries. 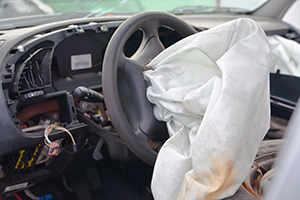 Experienced defective Takata airbag injury lawyers in Tulsa from our firm can help you fight for justice. Best of all, our legal team understands why people are injured by dangerous devices. Product-related injuries can be caused by manufacturing defects, design defects and incorrect advertising or a lack of product warning notices. There are also several entities that might be liable, including the manufacturer, testing laboratory or others. But, to find out if you can hold them accountable, you must contact us. We offer a FREE initial case review. So, you have nothing to lose by making a simple phone call.